Marathon season is in.. We’re sharing some nutrition tips! Carbohydrate loading (taking more than normal) and reduced training can be done for 2-3 days before the main event especially for events lasting longer than an hour. On the main race day, it is necessary to ensure that the carbohydrate stores in the muscles are full. On the day of the event, it is necessary to consume meals every 2-3 hours leading upto the event time. This depends upon what time the run is scheduled. 2 hours before the race, a combination of slower digesting carbohydrates and some protein maybe taken., eg., oatmeal, fibrous fruit, egg whites, skimmed milk/paneer, jowar-bajra bhakris, dalia, nachni etc may be good options. 30 minutes before the event, an additional source of simple carbohydrates such as toast with jam or raisins or a banana may be taken to top up the liver stores. Fat and fibre maybe kept low to avoid digestive disturbance especially as anxiety builds pre event. Several combinations maybe tried during mock runs to see what fits best. During the run, a steady supply of carbohydrates will ensure optimal performance. Sources should be simple and convenient to access such as a sports drink or energy gels. If these cannot be sourced, raisins or honey could become the next choice. Fruits will be harder on digestion. Roughly 30-60 gm of carbohydrates should be furnished per hour for runs lasting longer than an hour. Ideally these should be taken around 30 minutes after starting the run. Sports drinks furnish the right amount of electrolytes, carbohydrate and water as a combination and are therefore the ideal choice. Some amino acids such as branch chained amino acids and glutamine can also be added. Post race, food should be a combination of simple/fast release carbohydrates eg., 1-2 med. bananas, 300 ml watermelon/ grape or mango juice, maltodextrin (from supplements), 3-5 Tbsp glucose powder and fast digesting protein eg., 1⁄2 to 1 scoop of whey protein in water within the first hour progressing to complex/slow release carbohydrates consisting of whole grains and slower digesting high biological value proteins such as dairy or non veg foods every 2-3 hours.ced, raisins or honey could become the next choice. Fruits will be harder on digestion. Roughly 30-60 gm of carbohydrates should be furnished per hour for runs lasting longer than an hour. Ideally these should be taken around 30 minutes after starting the run. 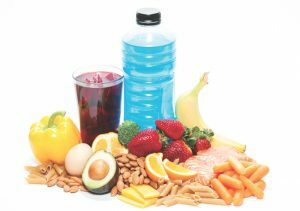 Sports drinks furnish the right amount of electrolytes, carbohydrate and water as a combination and are therefore the ideal choice. Some amino acids such as branch chained amino acids and glutamine can also be added. Post race, food should be a combination of simple/fast release carbohydrates eg., 1-2 med. bananas, 300 ml watermelon/ grape or mango juice, maltodextrin (from supplements), 3-5 Tbsp glucose powder and fast digesting protein eg., 1⁄2 to 1 scoop of whey protein in water within the first hour progressing to complex/slow release carbohydrates consisting of whole grains and slower digesting high biological value proteins such as dairy or non veg foods every 2-3 hours.